This website is designed to promote Senator Tiruchelvam's Legacy by Ram Balasubramaniyam, a collection of speeches of Senator M Tiruchelvam, a former Cabinet Minister and Solicitor-General in Ceylon. The book was published in November 2007, to mark the Senator's 100th birth anniversary. Further material is found on http://tiruchelvam.blogspot.com/. We reproduce a tribute written by Prof. A. J. Wilson of the University of New Brunswick, Canada in 1981. It is a curious phenomenon in recent Ceylon Tamil social life that some families have tended to give rise to two famous persons at a time from their ranks. The Ponnambalam brothers, Ramanathan and Arunachalam; the Saravanamuttus, Sir Ratnajothi, Colombo wartime mayor and Paikiasothy the civil servant who handled our tea and rubber quite successfully; C. Vanniasingham, the parliamentarian and C. Balasingham, his reputed civil servant brother and in present times, Murugeysu Rajendra, a distinguished former Secretary to the Treasury and the late Senator Murugeysu Tiruchelvam, eminent Queen's Counsel, a very honourable Minister of Local Government and the supreme political strategist, par excellence, of all time in Tamil politics. Senator Tiruchelvam was in every way, but in name and blood relationship, the son of my father-in-law, the late SJV Chelvanayakam. I came to know him in 1952 and was his close and admiring friend throughout this phase of his life until his sad and premature demise in 1976. My father-in-law regarded him with love and affection, chided him at times as if he were his own child, and implicit father in him. Tiruchelvam for his part reciprocated this confidence and trust and never ever uttered a word of criticism against my father-in-law. Such was the bond that held these two men together. In part, the close ties were due to the fact that as a boy Tiruchelvam was sent to Ceylon to attend secondary school at St. Thomas's by his parents, and his ward, guardian, and foster father from then onwards was Chelvanayagam. He learned his law and imbibed his nationalism from his mentor but he was also in his own right a civilized and cultured man - he learned history and completed his degree in that discipline at the then University College. It is difficult to write about Tiruchelvam without the feeling of intense emotion. He had the capacity to evoke such attachment and it was principally due to his humane and lovable ways; he could strike the right chord in certain human beings. He had the will to survive and to triumph, to outmanoeuvre adversaries, and as my father-in-law once remarked in a different context, to display that rare quality of good generalship in times of adversity. When I was once despondent about the fate of my brother and his family after the great cyclone in Batticaloa district in 1959 Tiruchelvam gave me encouragement when he said that I should not despair; that human beings had a tremendous capacity to survive. He brought this philosophy into politics. Long before most other men (in the post-1947 period), Tiruchelvam showed evidence of intense devotion to the cause of nationalism. He was Sir Alan Rose's (Legal Secretary under the Donoughmore Constitution and later Chief Justice) junior in drafting the Soulbury Constitution and Rose accepted the junior's view that care was needed in the work of that Constitution. On Independence Day, 4 February 1948, Tiruchelvam boldly had the Nandi flag flying in his car, not paying attention to the consequence that could visit him. As one of the crown's most skilled lawyers, he did not seek to conceal his nationalism for petty gain or rapid promotion. In his profession, he was clever beyond comparison. His involvement in history enabled him to see the law in a clearer perspective and he had more than the capacity to split hairs. He could, like the English metaphysical poets of the seventeenth century, fuse disparate, relate distant and different things to each other, win argument by matching far fetched examples, all due primarily, in my view, to his successful training in another discipline. He had a mind that cerebrated nimbly. That mind was formidable asset to the country in the post 1956 years. Tiruchelvam's wide horizon and agile imagination enabled him to make three noteworthy contributions to the Tamil community. 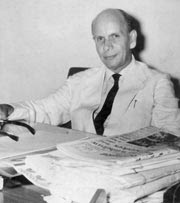 It was he who with the cooperation of J. R. Jayawardene steered the Federal Party into a coalition with Dudley Senanayake's "National Government' of 1965, thereby providing the Tamil people with the much needed opportunity to recuperate from the harsh and severe treatment accorded to them by the 1960-65 SLFP government headed by Mrs. Sirima Bandaranaike. He envisioned and was guiding spirit of the Jaffna University Movement. There were others whom he involved in the movement but it was he who received instructions, advice and political direction from Chelvanayakam. Between 1965-70, when he was Minister of Local Government, he could at any time have obtained a university, almost overnight, for the Tamil people within the precincts of the Jaffna peninsula but he preferred to go along with my father-in-law's desire to have the institution sited in Trincomalee. The people of the Eastern Province were not going to be let down by the Federal Party. It can nevertheless be said that it was due to his pioneering zeal that there is today a university in Jaffna. As Minister of Local Government, he framed the Tamil Regulations of January 1966 under the provisions of the Tamil Language (Special Provisions) Act of l958. He consulted me on the political implications of the regulations. And he made the excellent legal paint that "prescribed purposes" as provided for in the 1958 Act could mean either everything or specific matters. He chose the former and thus laid the foundation for the Tamil language becoming the language of administration in the Northern and Eastern provinces. He gave of his best in the framing of the District Councils Bill of 1968, a document which may well stand the test of time, a compromise which may have deflect the demand for Tamil Eelam had it been implemented. He was virtually its sole draftsman and his health perhaps suffered not a little in this deathly labour of love. It must also be mentioned here that he played a leading role in the trial-at-bar case involving prominent politicians of the Tamil United Liberation Front. In all this he played the sacrificial role. And he was to Chelvanayakam what Liaquat Ali Khan was to Jinnah. In 1976, the cruel hand of fate took him away from the country, an irreparable loss from which the country can never recover. A versatile man of such rare accomplishments can emerge only once in awhile. History, law and politics proved an unbeatable amalgam and it made him make history. As a person he remained youthful to the end, he could communicate freely with younger people, he was the complete liberal, emancipated and free from bias. He had a puckish sense of humour that together with his mordant wit sent his listeners into peels of laughter. More than everything else he was a loyal friend and a reliable ally. He gave himself unstintedly to the cause though in the process he was buffeted by strong winds. This tribute by the late Prof. AJ Wilson appeared in the Sunday Observer on April 23, 2006.